A new archive of locally sourced photographs, posters and documents will be launched later today revealing stories of Edinburgh's involvement in the first world war - some being made public for the first time. The online collection, titled Edinburgh's War, includes accounts of Girl Guides helping M15, Serbian refugee children being educated at George Heriot's School, and domestic science teachers from James Gillespie's School teaching soldiers how to cook. Much of the archive material was donated by local people, who will be thanked at a reception this evening in the University of Edinburgh, which led the collaborative project. Relics and stories were gathered from the likes of local historians, community groups, schools, clubs, libraries and businesses. The university's researchers praised the local involvement as "phenomenal." A key part of the archive is the drawing up a full roll of honour for the city's war dead. It is hoped that use of the Commonwealth War Graves Commission database, newspapers, memorials from churches will help to create an accurate roll. It will include the Royal Scots, Edinburgh's regiment, which lost 10,000 men. The archive also includes accounts of the sacrifices made by the city's sports clubs, including rugby teams and the footballers of Hearts and Hibs. Seven members of the Hearts time were killed in action, as this article by Alan Massie documents. The Port of Leith's significant contribution is also highlighted in Edinburgh's War, as is the role played by the city's six hospitals for the war wounded. The locals who pooled their relics have been invited to a reception at the university this evening as a mark of thanks for offering to share their archive material. The website will be launched at 7pm and can be viewed at www.edinburghs-war.ed.ac.uk. Yvonne McEwen, who works as an honorary fellow at the university's centre for the study of the two world wars, said she hopes the archive will continue to grow. "There has been a phenomenal response to this project so far with many of Edinburgh's major institutions opening their archives for the first time. What has emerged are some fascinating untold stories. "We are hoping that more organisations will come forward so we can continue to build this picture of the Edinburgh, Leith and the Lothians during World War One." 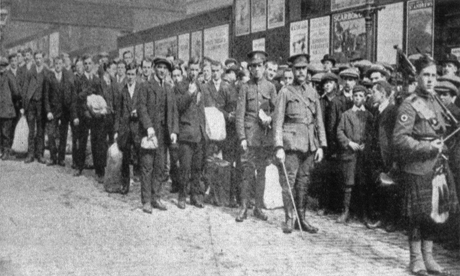 The university plans to expand the archive to cover other cities in Scotland in the lead up to the 100th anniversary of the start of the first world war. * Most of the Heart of Midlothian players joined Mcrae's Battalion during the first world war. But the part played by Hibernian during the conflict was less known. The team's stadium, Easter Road was made available to the military authorities for the training of new recruits, as was Hibs ground at Piershill. At the start of the war Hibs had only a small squad of around 15 players but it is said that within a short period of time at least seven Easter Road players were either in the armed forces or in a war related occupation. hospital. The small hospital was equipped with all the amenities of a war hospital, including an operating theatre. The castle hospital dealt with over 100 German casualties after the Royal Navy sunk the German battleship Blucher. Dalmeny House was also a temporary war hospital. * Early in 1915 a group of Scottish professional and business men met in Edinburgh and set up the Scottish Veteran's Garden City Association. One of the achievements of the group was Veteran housing in Longniddry complete with a piggery, shop, beehives and village hall. * The largest factory in Edinburgh during the first world war was the North British Rubber Company located at Fountainbridge and among other items they produced one million pairs of trench boots for the Western Front. *John Menzies lost 47 employees out of the 276 who left to join the armed forces. A note in a trade paper that "W. H. Smith and Son sent more than a thousand men to the colours" indicates the relative sizes of the two firms at that period. The names of the Menzies employees who never returned were inscribed on two war memorials in the Hanover Buildings in Rose Street.